Activism | the imperfect peach. 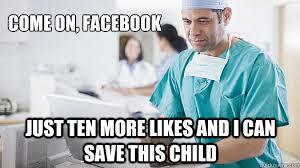 I’m sorry to inform you, but “liking” that photo will not save that baby. 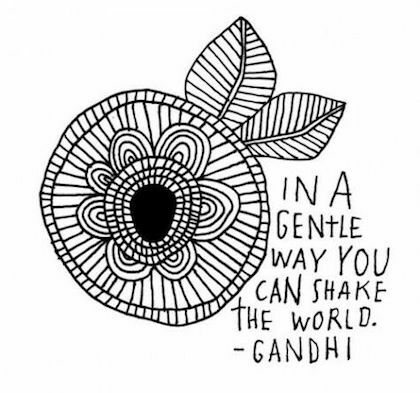 “Be the change you wish to see in the world” – Gandhi. Before I get going I would like to clarify some things from the outset. Of most relevance to what is to follow: I am not a particularly charitable person. That wasn’t a deliberately self-deprecating comment, but rather a realistic one. I enjoy doing volunteer work, but I haven’t done much recently (although that is something I am going to work on this year). I don’t contribute that much money to charities or other worthwhile causes. I don’t campaign or attend rallies. I don’t fundraise. I don’t work at an NGO or charity and I don’t have any particular intention of doing so within the foreseeable future. Basically, I could be doing a lot more to help others and the world. I would also like to emphasise that I do not intend to mock any of the causes or societal issues that I may mention. They all have real and devastating impacts on the lives of individuals throughout our world. So, I may not be a particularly benevolent person, but occasionally I’ll like a photo or status on Facebook in a gesture of sincere clicktivism. 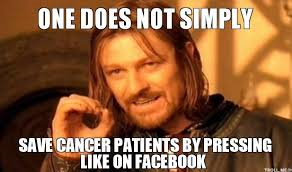 I’m sure you know the type: the one where if we reach 1 million likes will mean the difference between a chronically sick child’s life or death. Or perhaps a #makeupfreeselfie for breast cancer as you may have noticed mingled into your Facebook newsfeed over the past week. That has to count for something, right?? Well, actually, no. I don’t think so. Sure – social media is a useful tool in driving a marketing or PR campaign. Personally, I think that a campaign without a social media activation and strategy would probably be minimising its potential and reach… unless you’re targeting non-social media users! 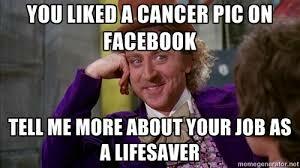 And yes, social media has been really beneficial to individuals who are suffering in some very practical ways. Take, for example, a dog I follow on Instagram. Yes, you read that correctly: I follow a dog on Instagram. Nice one, Alex. But to be fair, this isn’t any dog – it’s a hilarious French Bulldog named Sir Charles Barkley (You can call him Barkley for short). And with over 175K followers, Barkley’s posts travel far from his Seattle home. So far, his account has been used to find missing dogs and reunite them with their owners and raise money for pups who need expensive surgery in a similar way to how people who are seeking missing family members or a bone marrow donor have used Facebook to facilitate their search. I’m not for a second doubting the power of social media in helping to raise awareness about certain issues and causes and that it can be really positive and powerful. But tell me, how is sharing that photo of that baby actually going to ensure that it lives? How is liking an animal rights photo going to save that pig? How is retweeting Amnesty International really going to help those in need? How is following World Vision on Facebook going to make a difference in the lives of children and communities in developing nations? How is posting an attention-seeking status to the effect of “I want to do it on the kitchen bench” (which just happens to be a ‘secret thing amongst women’ about where you place your handbag down when you arrive at home) going to raise long-term, meaningful awareness of breast cancer? How is supposedly divulging which colour bra you’re wearing (which is a similar thing where the colour corresponds with your birth month) going to change anything either? How on earth is a makeup free selfie going to see an end to cancer? Please, do tell me. Ok, evidently it vaguely got my attention because otherwise I wouldn’t be typing this sentence, but have I done a breast check since seeing one of those #makeupfreeselfies? (I’ll give you a hint: two letter answer – first letter N, second letter O.) Bad Alex. Makeup-free selfies, in and of themselves, can be positive in helping to promote a healthy, realistic body image (as long as they’re not being used as an excuse for fuelling our vanity). And if this week’s campaign was about that, then I wouldn’t be going on this mini-rant, because I have a lot of time for initiatives which help people to develop positive body image. But the last time I checked, my selfies weren’t finding a cure for cancer or encouraging my friends into doing breast checks. So, evidently I’m the Grinch of Breast Cancer awareness. You’re welcome to get pissed off at me. You may disagree with me, but really, who the hell are we kidding? It’s great that we want to get involved and do our bit. But why don’t we do something which is meaningful, that is going to make a difference. We can contribute through the donation of time or money, for example. No, it may not get as many likes on Facebook. It may not make you look quite as baben on Instagram. It may not make you look like the socially aware, caring person that you wish to portray yourself as being. But perhaps it could actually make a difference. PS: To the anonymous person who passed on a message to me through our mutual friend over the weekend – thank you! Also, come and say hi next time? Since writing this I’ve found out that the #makeupfreeselfie trend has in fact raised a couple of million quid in the UK. This is great stuff. However, I know it may sound cynical and critical, but I find it repugnant that people were only, seemingly, spurred into action by the fact that doing so contributed to their social media self-promotion. For me, the idea of giving isn’t about the giver, but the recipient. In addition to this, I’d love to recommend Clementine Ford’s article in relation to the topic. She’s ace and so is her piece. Find it here.